Another week has been masterfully negotiated and a boozy weekend awaits. Not before I delve into more obscure heavy metal though! I'm sticking with the sludge/doom end of the genre following my review of Weed Demon earlier in the week but this time I'm moving back across the globe to Finland and the sounds of Lurk. The band formed back in 2008 and their debut self-titled full-length in 2012. 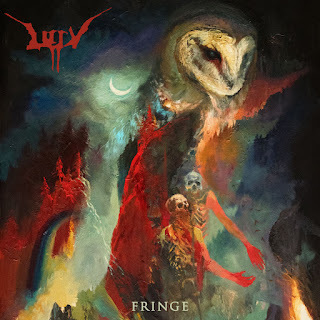 They followed with "Kaldera" two years later before initially self-releasing "Fringe" in 2016. It's now due for physical release on both cd and vinyl thanks to Indian extreme metal label Transcending Obscurity Records. They've called some of Finland's most revered labels home in the past and they've been receiving great press already for this record, so they're clearly reaching the right ears. Atmosphere has always been a big part of what drew me towards metal and why I enjoy it so much. Lurk weave it into their music so well with melodies that are both soothing and frightening at the same time on “Fringe” opener Ostrakismos. Most of the song is instrumental and when vocals do appear, they’re cocooned within the instrumentation and are actually really subtle, giving it a slightly gothic slant. It’s clear that Ostrakismos was a mere teaser of an opener as Lurk launch into the instantly heavy Tale Blade without so much as a build up. This time semi-clean vocals back up the deep roars. Given Finnish doom’s illustrious past it’s only natural that the blueprints forged by the likes of Reverend Bizarre, Hooded Menace and Profetus would seep into Lurk’s iteration, but with the sludgy murk and use of the aforementioned melody, they do manage to make something that sounds their own. With this being their third full-length, there’s an obvious air of confidence and quality in the song-writing. I mean that in a positive way, as no song lasts too long or is too overblown. Reclaim is a martial and almost hypnotic number that retains a mid-paced (for sludge/doom) tempo. They channel their true-doom side with the truly mournful Elan, which breaks up the extremity with low but clean sung vocals that brings Amorphis to mind. They do revert back to using harsh vocals towards the end and in doing so, they succeed in making the song scarier on the ear. I’m not one to make up sub-genres for the sake of it but Offshoot has an air of sludge ’n’ roll to it thanks to the driving tempo of the opening sixty seconds. It’s variation that’s important and it fits in between the slower sections perfectly, making the song pass by in a wave of urgency. Furrow, as the name suggests, drags things back down though and in subtle off-kilter fashion, Lurk banishes any upbeat feelings you may have. They remind you just how fragile you really are, without pushing you completely over the edge. Penultimate song Nether is a classic with a sense of industrial coldness to it, which is made more effective by it’s shorter playing time. There’s more traditional metal within it’s bars and that’s no bad thing. Lurk don’t settle for just one form of metal, as it would be easy to sound formulaic when trying to pull this off. They remain forward-thinking within their small plot of the extreme metal landscape. The album’s final number Proteus Syndrome is it’s longest and is the band’s last opportunity to bury their misery into your memory, which they actually do pretty effectively. “Fringe” is the perfect length and contains enough momentum to keep you listening intently throughout. The slow train shows no sign of stopping in Finland and Lurk are one of it’s more modern and exciting proponents. Worship them! "Fringe" is also available to pre-order on all formats from Transcending Obscurity Records above.